In the introduction to his bestselling 1957 book The Hidden Persuaders, American journalist Vance Packard wrote about the ‘probers’, using their psychoanalytically driven ‘depth approach’ and ‘systematically feeling out our hidden weaknesses and frailties in the hope that they can more efficiently influence our behavior’. American psychologists at advertising agencies were, he warned, ‘probing sample humans in an attempt to find how to identify, and beam messages to, people of high anxiety, body consciousness, hostility, passiveness, and so on’. Thus persuasion was painted as intrusive, targeted and all-powerful: ‘You can probably make them do anything for you: Sell people things they don’t need; make women who don’t know you fall in love with you.’ Packard’s approach arguably fuelled a mistrust that has lasted for decades. But the world is now a very different place. By 2005 more than half of households in Great Britain had access to the internet, and even since then our social, political and consumerist lives have changed beyond recognition. The technology channelling the persuasion to us is becoming more complex: it’s harder for us to understand who is seeking influence and how, or potentially even to have any awareness it could be happening. We’re confronted with a stream of emotional appeals, conspiracy theories, social-media-proliferated propaganda and ‘fake news’. Psychologists remain at the heart of these issues. The Cambridge Analytica (CA) scandal saw researchers use personality tests taken on Facebook to create ‘psychographic’ profiles of voters, with data sold on to enable targeted messages for the Brexit ‘Leave’ campaign group, and Donald Trump’s and Ted Cruz’s presidential campaigns. Reports of the CA data being accessed from Russia, and hundreds of social media accounts operating from the Russian Internet Research Agency and attempting to influence UK politics, refuelled the ‘Cold War paranoia’ that was so key in Packard’s era. We’re not talking about which brand of shampoo we buy here. Political decisions reflect our ideologies. Can the ‘new hidden persuaders’ really be shaking our foundations, the very core beliefs we hold dear, and all without us even realising? Research published in Science by Soroush Vosoughi, Deb Roy and Sinan Aral layers a worrying trend on top of this: misinformation reaches more people online than the truth. ‘The top 1 per cent of false news cascades diffused to between 1000 and 100,000 people, whereas the truth rarely diffused to more than 1000 people.’ They also observed that the truth took around six times as long to reach 1500 people compared with ‘fake news’ (a data set of ‘rumour cascades’ on Twitter from 2006 to 2017). Cialdini’s remaining principles are ‘consistency’ (highlight any prior actions or beliefs that are consistent with your target behaviour); ‘reciprocity’ (encourage a feeling of obligation to give back to those who have given us or shown us something), ‘authority’ (the use of apparently credible experts in persuading us to buy, do or believe something); and ‘liking’ (deliver messages via someone a person likes). These principles are perhaps universally amplified on social media. In the past a toothpaste company may have relied on putting a dentist, complete with white coat, centre stage in its ads; now we often turn to the aggregated opinions, reviews and ‘likes’ of our peers. This potential for persuasive messages to be amplified by online groups becomes all the more important given our tendency to dwell in ‘echo chambers’ – surrounding ourselves with people who hold similar worldviews and reading/liking/sharing information that chimes with our thoughts and experience. It’s confirmation bias on a mass scale, and there’s some evidence it is negatively skewed. So far, so shadowy. But perhaps we need to shine a different light on the ‘new hidden persuaders’. Tom Stafford suggests our commonsense understanding of persuasion, and psychological explorations of it, do not reveal the true mechanisms behind how we are persuaded, and potentially overstate the extent. So psychologists are surplus to requirements in the real world of advertising and political campaigning? Not so fast. There is research that suggests psychologically tailored adverts can bear fruit – for example a study led by Sandra Matz found that adverts tailored to match individuals’ level of extraversion and openness led to more purchases of beauty products, a crossword app and a game. Many psychologists are working to find ways of protecting ourselves against persuasive attempts, and awareness is key. Writing in CREST Security Review Stephan Lewandowsky, Sander van der Linden and John Cook point out that misinformation is ‘sticky’ – even when people know it to be false in the face of facts from a trusted source, they may carry on believing it regardless. That’s where inoculation, or pre-bunking, comes in – we need to get in before persuasion sticks. Studies by the above authors, along with Ullrich Ecker, have found making participants aware that that information they read may be inaccurate and that people still rely on facts that have since been retracted due to inaccuracies, can cause people to rely on misinformation to a lesser degree. They have also had success in making participants aware of other methods, including exposing the ‘fake expert’ persuasion strategy; at play in debates around smoking in the past, and climate change in recent years. A simple awareness of persuasive attempts, and the methods used to manipulate us, seems vital. Another potential strategy, put forward in a pilot study by van der Linden and Jon Roozenbeek, is to have people play a ‘fake news game’, in which participants use misinformation strategies to come up with their own fake stories from the perspective of different characters – a denier, an alarmist, a clickbait monger and conspiracy theorist. In their sample of 95 students aged between 16 and 19, the researchers found that playing the game reduced the perceived persuasiveness and reliability of fake news stories. An obvious problem with researching an article about ‘the new hidden persuaders’ is that such people are, well, hidden. 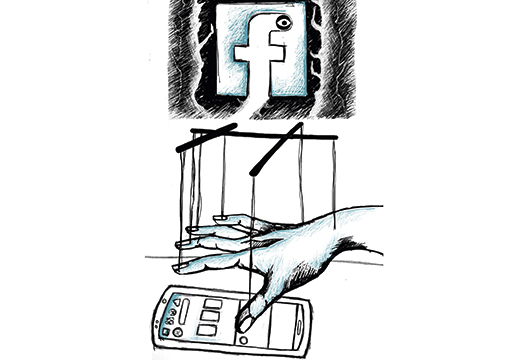 Rumours abound about psychologists working on persuasive methods with big tech, consumer companies and governments. It’s a professional concern that such people may be operating with little ethical oversight. Building trust and transparency, and keeping the public engaged in these discussions, would seem vital if we are to quell the paranoia we feel in the face of new technologies. …Or perhaps that’s just what the ‘depth man’ wants us to think.